I used to wear cut-off jeans, a tank top and flip flops to play golf. It's true. (I'm not proud.) Sam Snead Executive Golf Course is a par three golf course in Titusville, Florida, where there's not much of a dress code. (The code is that you have to be dressed. That's it.) Thus, you can imagine my embarrassment when I showed up the first time at a legitimate municipal golf course and was told I couldn't play "because of my attire." "Sir, I don't know what you're talking about," I said to the pro, "I don't have a tire; I'll be carrying my clubs!" All joking aside, you can never go wrong with Adidas clothes. I really like these shorts. Of course, khaki goes with everything (which is important when you have so many different colored golf shirts). 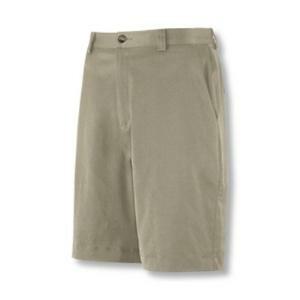 My favorite thing about the shorts is the lightweight material, which is very comfortable and moves with me when I walk or swing. In fact these are way more comfortable than those cut-off jeans. Now if only I could get past the pro in my tank top.